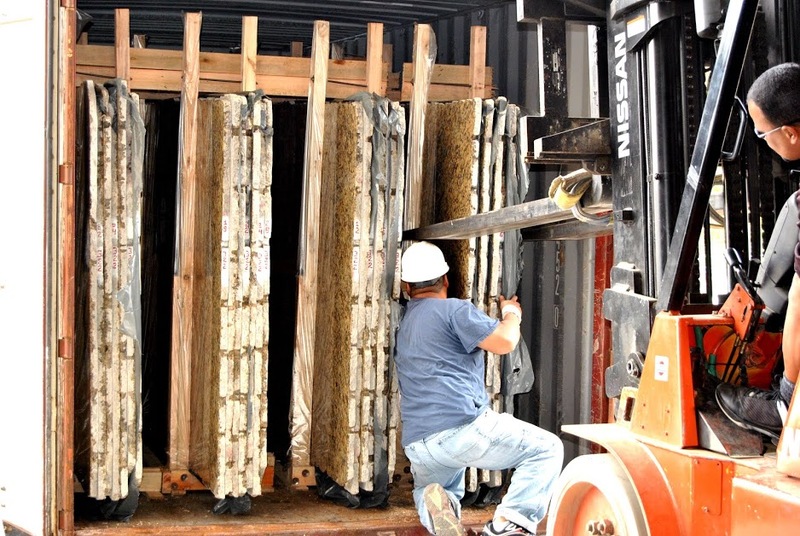 Granite Slabs arrive daily to our Granite Countertop Warehouse locations via truck directly from the port of Savannah. The shipments arrive from quarries around the world, from far off locations such as India, Brazil and Africa. Upon reaching port and passing Customs, the granite slabs are inspected again and sorted in a holding warehouse. The slabs are then carefully loaded loaded on the trucks and send to their ultimate destination. GCW staff takes great pride in delivering the finest stone while maintaining the highest safety standards in the industry. Natural stone is very heavy and requires specialized machinery to move and store the slabs. GCW has many machines available onsite in order to be able to show the to customers. Customers are able to inspect the slab for its unique qualities in the color as well as other qualities of the stone.